The blast furnace is the most easily-recognized structure in a steel mill, but it is not where steel is made. The product of blast furnace is liquid iron, which is reduced from iron ore. The ingredients that go into the blast furnace are iron ore, limestone, and coke, which are mixed with a high pressure "blast" of hot air (the source of the name "blast furnace."") The coke is the fuel, which heats the other ingredients The impurities in the iron ore are absorbed by the limestone to form slag. Periodically, the slag and the liquid iron are tapped from the furnace and poured into special railroad cars for transportation to other parts of the steel mill or to other mills. The hot metal cars are lined with refractory materials to keep the heat of the liquid iron (at over 2,000 degrees) from melting through the cars' sides. 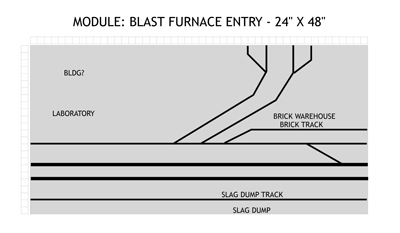 This module is constructed in three sections, due to the size of the two blast furnaces and complexity of the track work needed for the rail cars going in and out of those furnaces. The blast furnaces module, while construction was in progress.